Paper summary davidstutz Alaifari et al. propose an iterative attack to construct adversarial deformations of images. In particular, and in contrast to general adversarial perturbations, adversarial deformations are described through a deformation vector field – and the corresponding norm of this vector field may be bounded; an illustration can be found in Figure 1. The adversarial deformation is computed iteratively where the deformation itself is expressed in a differentiable manner. In contrast to very simple transformations such as rotations and translations, the computed adversarial deformations may contain significantly more subtle deformations as shown in Figure 2. The authors show that such deformations can successful attack MNIST and ImageNet models. https://i.imgur.com/7N8rLaK.png Figure 1: Illustration of the advantage of using general pixel-level deformations compared to simple transformations such as translations or rotations. https://i.imgur.com/dCWBoI8.png Figure 2: Illustration of untargeted (top) and targeted (bottom) attacks on ImageNet. Also find this summary at [davidstutz.de](https://davidstutz.de/category/reading/). Alaifari et al. propose an iterative attack to construct adversarial deformations of images. In particular, and in contrast to general adversarial perturbations, adversarial deformations are described through a deformation vector field – and the corresponding norm of this vector field may be bounded; an illustration can be found in Figure 1. The adversarial deformation is computed iteratively where the deformation itself is expressed in a differentiable manner. 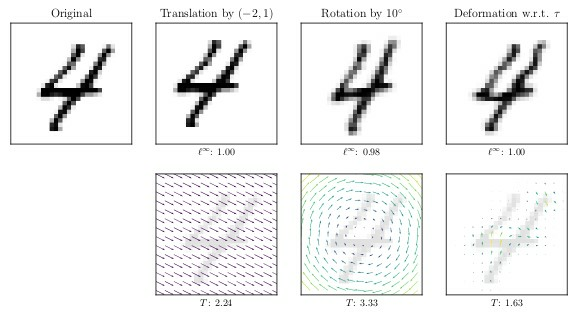 In contrast to very simple transformations such as rotations and translations, the computed adversarial deformations may contain significantly more subtle deformations as shown in Figure 2. The authors show that such deformations can successful attack MNIST and ImageNet models. Figure 1: Illustration of the advantage of using general pixel-level deformations compared to simple transformations such as translations or rotations. Figure 2: Illustration of untargeted (top) and targeted (bottom) attacks on ImageNet.